La sovrabbondanza di informazione implicita nell’era del web è un’inondazione in cui il nostro cervello rischia di annegare? David Weinberger, nel suo nuovo libro (Too Big to Know) pensa di no. Anzi, sostiene, stiamo entrando in una nuova età dell’oro. Salon l’ha intervistato. The last two decades have completely transformed the way we know. Thanks to the rise of the Internet, information is far more accessible than ever before. It’s more connected to other pieces of information and more open to debate. Organizations — and even governmental projects like Data.gov — are putting more previously inaccessible data on the Web than people in the pre-Internet age could possibly have imagined. But this change raises another, more ominous question: Is this deluge overwhelming our brains? 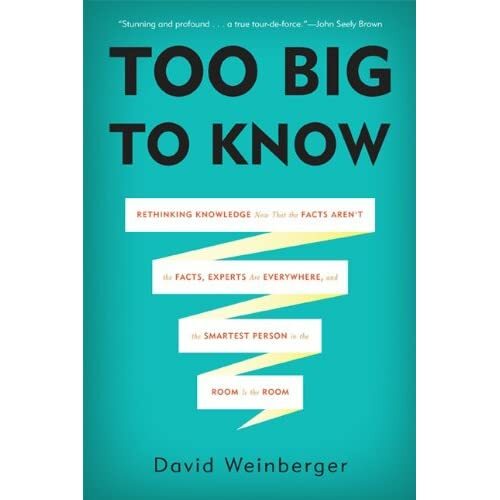 In his new book, “Too Big to Know,” David Weinberger, a senior researcher at Harvard’s Berkman Center for Internet and Society, attempts to answer that question by looking at the ways our newly interconnected society is transforming the media, science and our everyday lives. In an accessible yet profound work, he explains that in our new universe, facts have been replaced by “networked facts” that exist largely in the context of a digital network. As a result, Weinberger believes we have entered a new golden age, one in which technology has finally caught up with humans’ endless curiosity, and one that has the potential to revolutionize a wide swath of occupations and research fields.